Since moving to Ukraine, I've been keeping a journal. I try to write in it every day, even if it's just a couple lines, about what I did, what I learned, who I met, how I felt, and so on. I wrote seven pages about my last night in Lutsk, the evening of our farewell dinner. Seven pages. About one night. I think that's an indication of how many memories I made in my two months there. Last summer, I saw Волинський народний хор, the Volyn song and dance ensemble, perform in Lviv. The dancers are under the artistic direction of Valeriy Smyrnov. 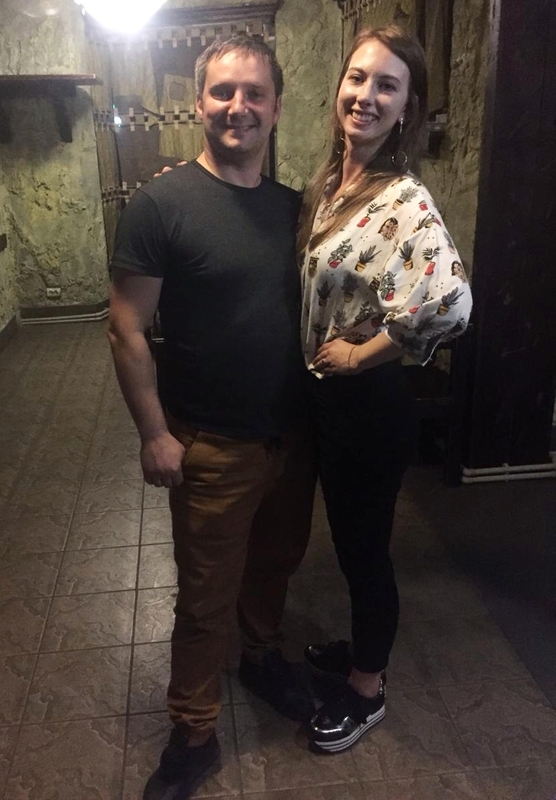 I was in Lviv with Troyanda for the International Ukrainian Dance and Culture Festival, and we had a workshop with some of the Volyn dancers. Between the number of people in the studio, the heat, and the surreal feeling of being in Ukraine surrounded by people I look up to, the workshop was a bit of a whirlwind. I don't remember much from it, but I do remember being impressed with the number of ways you could polka with someone — all in the Volyn style, yet — and that one of the dancers kept reminding me to keep my thumbs tucked in when my hands were on my hips, which was a reoccurring correction when I trained with them for two months (don't worry, I broke my habit eventually). Though I saw the ensemble perform and did a workshop with them, I still had no idea what to expect for my time in Lutsk. The Volyn philharmonic is one of my favourite buildings in Ukraine. Photo by Hannah Picklyk. We headed to the studio on March 1 for our first day, and it's safe to say I fumbled through the entire class, flailing my body around during centre work, which was some of the most difficult ballet we've seen during our time in Ukraine. The dancers welcomed us into their ensemble right away and would help us as much as they could, whether it was quietly telling us during barre what came next or breaking down how to brisé, brisé, dessous, dessus. Though I know it didn't always show in my ballet skills, this is the city I improved the most. And I have the entire ensemble to thank. So what got me to this place I am now, where I know the difference between a flic flac and a double flic, where I can tell apart Volyn tynok from Polissia tynok, and where I can now chaînés at rapid fire speed (...I wish)? Let's head into the studio. The studio, located in the Volyn philharmonic building, was beautiful. Large windows let in natural light, the floor didn't totally destroy my slippers, the temperature was always perfect since someone came in to adjust as needed, and there was plenty of room to dance, even with six extra Canadian bodies in the hall. Three eager beavers practise their brisés (and smiles) before class. Thanks for the pic, Mom. Class started at 11, but we'd get there early to practise barre and centre work. We Canadians have varying levels of ballet training — some took classes for only a couple years, like me, to improve their Ukrainian dance skills, and others have trained in ballet for most of their life. The Volyn ensemble learns a new ballet barre about every two weeks, or maybe longer if they have lots of shows. Roman Smyrnov, Valeriy's son, leads ballet, and if he was absent, dancer Oleksiy Lets would. We started facing the barre, doing basic movements to get us warmed up, before doing your typical ballet barre (plie, tendue, frappé, etc). There was also time to stretch built into the exercises, which took some getting used to since I sometimes found it hard to think on the spot (yes, even for something as simple as stretching), but it was definitely welcome and needed. Sometimes we'd start barre using our left leg as the working leg, rather than the right, and though this seems like a minor switch up, it ensured you weren't just moving through the motions and kept you thinking the whole time. Next we had centre work, with girls and boys split into a couple groups to give each other space to dance. Changement, jetés, assemblés, glissades. We'd do about six combinations, sometimes less depending on if the ensemble had many upcoming or recent performances. Centre is one area that the other Canadians and I feel like we improved a lot. We went from barely marking the combinations bashfully at the back to going in our own group to give it our all. No, I didn't once do anything perfectly, or even near perfectly, but for me to even do a combination that has multiple different ballet steps put together is a pretty big improvement. After centre work, we did technique, including turns from the side, turns on the spot, and some combinations. Ballet and technique took between 45 minutes and one hour, then we'd have a break. But we'd stay in the studio to work on the exercises, the other dancers breaking them down for us. How they had so much patience I do not know, but I am thankful for it. Some of the dancers are also dance instructors, and they knew just what to say to help us better understand the steps. While we trained in Lutsk, the Volyn ensemble had many performances, some of which we attended. Often before performances, the ensemble would have full choir and orchestra rehearsals. They'd run most of the dances of the show, or at least the start and end to make sure transitions were clear. If there was no choir and orchestra rehearsal, Valeriy would work with the dancers, breaking down a couple dances to make sure everyone looked the same, right down to character and stage presence. This hat is truly enchanted. We'd dance at the back, picking up as much as we could, but where we really learned was on the breaks. A dancer or two would stay to work with us, teaching us parts of dances that eventually connected into full dances. When the dancers went out of town for shows, Valeriy had rehearsals with us Canadians. It was amazing to work with him, his contagious smile catching on as he demonstrated a step. We learned sections of various dances, and he would make sure we got even the smallest nuances so we matched the ensemble's style. As a dancer working with various instructors and ensembles in one year, I find one of the hardest parts is figuring out and matching the style of the dancers — the angle of your head, how you hold your body, your facial expression. But it's also one of the funnest parts, because if you work hard enough, and have a bit of luck on your side, from time to time you might catch a glimpse in the mirror and see yourself blending in with the dancers around you. Valeriy Smyrnov shares his Volyn ethnography expertise with us. Like matching the Volyn style, another major adjustment was dancing with strong male partners. We were starting to get used to it after training with the Bukovyna ensemble. But we still sometimes dance too stiff (since we're used to leading the boys in Canada ... no offense), and the Volyn boys would remind us to relax. So, takeaways from dancing in Ukraine for a year: Guys, please know what you're doing, lead your partner, and smile! Before one rehearsal with only Valeriy, we learned about Volyn ethnography, focusing on costumes. Other countries, like Poland and Belarus, and other regions, like Polissia, influence Volyn dancing and costumes. It's all really interesting to learn about, though once you learn a bit, you realize how much more there is to know. Our second week in Lutsk, we watched two back to back performances of the ensemble's spring show. The first one, we watched from backstage. Everyone was so kind, encouraging us to walk around to get different views of the show. The second, we watched from the audience, and after the show, the boys gave us flowers for International Women's Day. Both the choir and the dancers have unbelievable stage presence, bringing you right into the performance with them. Even during rehearsal, everyone is smiling and in character. Throughout my life, I've had instructors who always said to smile during rehearsal, no matter how goofy you feel. But come on, dance is fun anyways, so of course you're going to want to smile. Anyways, the Volyn ensemble just goes to show that practice makes perfect. We went to two out of town shows, one in Kovel and one in Lokachi. But I think my favourite performance was the final one we saw, on our last night in Lutsk. 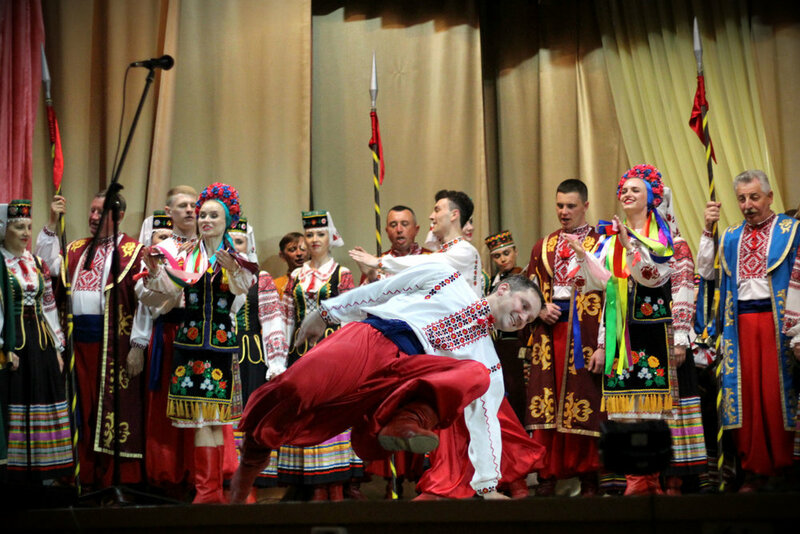 The dancers, with no choir or orchestra, performed at the year end recital of the Volyn College of Culture and Arts. Before the show, we ran into Roman who said his goodbyes to us, adding that he was going to dedicate the performance to us. If I wasn't already feeling emotional about leaving the city, then I was now. They performed Polka Sverbylivka, one of my favourite dances. It was the best I have ever seen it. They were having so much fun, interacting with the audience and with each other. It was a great finale for our time in Lutsk. The first show we attended was the spring concert on March 7. We hopped on the Volyn ensemble’s bus and headed to Lokachi for a show on April 22. I'm proud to say I can now offer krumping workshops. Thanks for showing us around town, Tanya and Lesya. And that's not to mention all the other dancers who invited us out on the town, making us feel like we were one of them. We even sang karaoke with some of the choir members. But we're still waiting on our Ukrainian "yelp" workshop (listen to a Volyn song, and you'll see what I mean). We also attended concerts of School #25 and Radist, the Ukrainian dance school we watched a couple classes at. It was neat to have watched the dancers at class only a couple weeks before, then seeing them at the show and how much they improved. 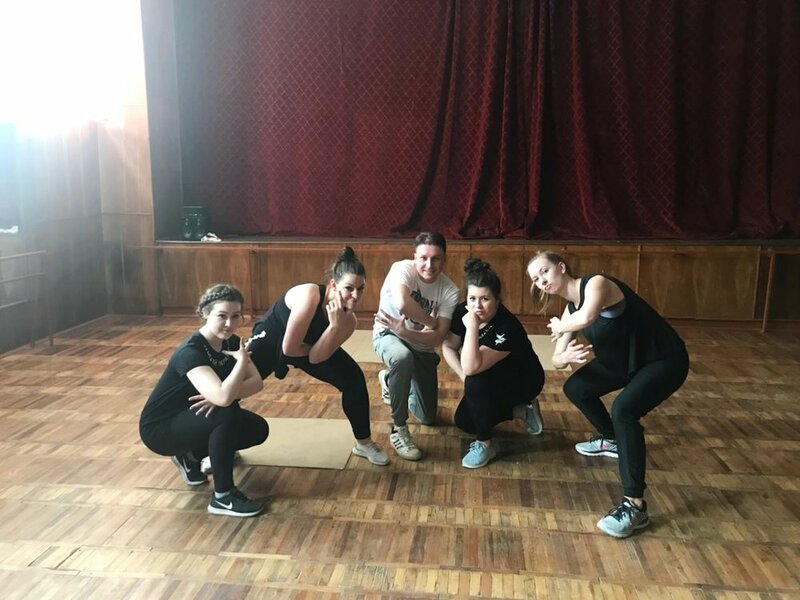 One big observation at any dance classes we've watched in Ukraine — the students pay attention to their instructor the entire time. That's not to say all classes are chaotic in Canada, but sometimes it feels like that's the case. April 26, 2018. What a day to remember. A day to relive. After ballet and technique, the choir and orchestra came into the studio for a full rehearsal. Up first: Канадські дівчата (Canadian girls) performing Перший номер, the first dance we learned in Lutsk. We stood "on stage" in the background as the choir sang a song. We all were trying to take in as much as we could. We were surrounded by current (and I'm sure, future) honoured artists of Ukraine. We were standing next to professional dancers, people we've looked up to since we were kids learning 1-2-3. And we were in a room full of friends who felt like family. Not exactly sure of when the song was going to end, I saw the Volyn guys stand a little straighter, so I figured that was our cue. And then it started. I couldn't not smile if I tried. We could feel the eyes and smiles of the choir, orchestra, and other dancers on us, and that made us even more excited. And proud. And inspired. Even though this wasn't a true performance, per se, this is still going onto my list of Most Memorable Performances. Oleksandr Stadnyk, the director of the entire Волинський народний хор, gave a speech, wishing us all the best, and Hannah did a speech on behalf of us Canadians, and then everyone sang the most beautiful Mnohaya lita you or I have ever heard. How beautiful was it? I sent a video of it to my mom, forgetting to warn her of its beauty, and let's just say she had to wait a few extra minutes in her car before going into an appointment so she could collect herself. The ensemble ran through a couple other dances later in the rehearsal in preparation for an upcoming show, and we sat on the windowsill, in awe of what we were watching, of what we just did, and of everything that happened in that studio during the past two months. We've been away from our family and friends for a long time. OK, so I've been lucky enough to have had multiple family members visit me in Ukraine — one sister in Lviv and my other sister, my parents, and my godparents in Lutsk. But I of course still miss everyone in Canada. Thanks to people like those in the Volyn ensemble, the part of our hearts that misses our family and friends hurt a little less when we were with them. You know how when you admire and respect someone so much, you put them on a pedestal, but then if you're lucky enough to meet them, you often realize they're just another regular human being, and though they may be great and talented, you see them back on your level? Oleksiy Lets, the best of the best partner for Перший номер. Well, that concept didn't hold true for the dancers and directors of the Volyn ensemble. After meeting them, getting to know them, seeing how hard working they are (example: some work multiple jobs), and being lucky enough that they still managed to find time to have a few drinks and conversations with us, I admire them even more. They are on an even higher pedestal, at a level I can only dream of attaining. This post took me longer than usual to write. Between singing along to an album by the choir, re-re-re-re-re-watching videos, and looking at photos, a lot of reminiscing — and a lot of missing — was going on. But I'll be back someday. Or maybe you'll come to Canada. Whatever the case, our Ukrainian roots brought us together, and they'll forever keep us connected. I wish you all the best in your careers, lives, and dreams. Until we brisé together again, Волинський народний хор. And to that I say Повеселились на повну.